First residents of the Arabella, a 99-unit luxury condo just inside the Loop off San Felipe, will start moving in next week, said Roberto Contreras, president and CEO of Houston-based DC Partners and co-developer on the project. The opulent 33-story building that boasts private swimming pools in several penthouse units is 82 percent sold, Contreras said. Remaining units start at $925,000, while remaining penthouse units start at $2.8 million. He expects to sell all units in the building sometime between now and March. Longtime Houston developer Randall Davis told the Houston Business Journal in July that the first units would deliver sometime in October. Citywide delays following Hurricane Harvey and additional work in the lobby pushed the timeline back, Contreras said. Now, Contreras said it’s the lobby itself that is his favorite part of the building, with its high ceilings, marble floors, chandeliers and unique fireplace that distinguish the condo at 4521 San Felipe St.
“This is a step above everything we’ve done before,” Contreras said. He estimates construction costs to top $100 million. One of the biggest challenges of the project — and other condo projects — is securing financing, he said. Contreras counts 13 people who invested either $500,000 or $1 million into the Arabella through the federal EB-5 program, where foreigners can invest in a qualifying project that will create jobs in exchange for a Green Card. Units range in size from 1,100 square feet to 4,000 square-foot penthouses. Along with an outdoor pool, there’s an indoor pool, sauna, massage room, wine room and conference rooms. Several units have direct elevator access that can take residents straight into their unit. Homeowner association fees average $700 per month for the smaller units, $1,200 a month for medium units and $1,900 per month for penthouses, Contreras said. The Marlowe, another condo collaboration between Davis and DC Partners, has 17 out of 99 units remaining. 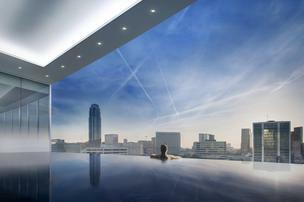 Move-ins for the downtown property near Discovery Green started a few weeks ago, Contreras said. Remaining units start around $480,000 for a 990-square-foot condo.